ViviComb is an amazing product. Its design is based on broad knowledge and numerous studies on treating the problem of hair loss, occurring both in men and women. The leading idea that the producers of this laser comb has followed was to provide users with maximum effectiveness and safety. We know that hair loss is a serious problem affecting many of us. Take the challenge today and start fighting hair loss using ViviComb! More than 90% effectiveness in treating hair loss. 20% new hair growth on average. It does not only counteract hair loss, but also stimulates hair growth and improves the condition of your skin on the head! ViviComb uses an innovative Low Level LaserTtechnology (LLLT), which until now has only been available in devices used by specialized clinics! Increases the production of ATP in the body. Shows a biostimulating effect and is used in phototherapy. It is believed that ViviComb activates telogen hair (hair in the resting phase). Reverses the process of hair miniaturization. Makes hair enter the anagen phase (active hair growth). Amazing results in treating hereditary baldness. An ideal alternative to treatments at medical and cosmetic clinics, which are a significant burden on a budget. An alternative to pills, creams and chemical products. 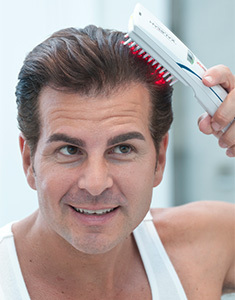 Comfort of using the laser comb at home, without having to go to a beauty salon for the treatment. Lightweight and handy device that is easy to use. Thoughtful design ensures that laser pulses directly reach the skin on the head. Using ViviComb does not cause any side effects and is absolutely safe. Has the approval of Food & Drug Administration. The device is certified in accordance with ISO quality standards. First effects are visible after 8 weeks of use.